More than just a walkway between classes, the Garth has been a popular place for lunch and socializing. Over the years, this open area immediately south of Payton Hall has been used for Christmas tree lightings, graduation events, class sessions, art installations, and even a few Brehm Center dance parties. “Everyone remembers where they were when they heard about the Challenger disaster. I happened to be standing at the bulletin board in the Garth with a friend on January 28, 1986, when the NASA space shuttle Challenger broke apart, killing all seven crew members. I remember the sadness that everyone suddenly felt as the news spread around the Garth and the campus. School teacher Christa McAuliffe was on the flight and it brought me much sadness because my mother, also a school teacher, had become deceased at a young age. I remember the memories that the disaster brought and the pain it would bring to her family as something similar had impacted mine. 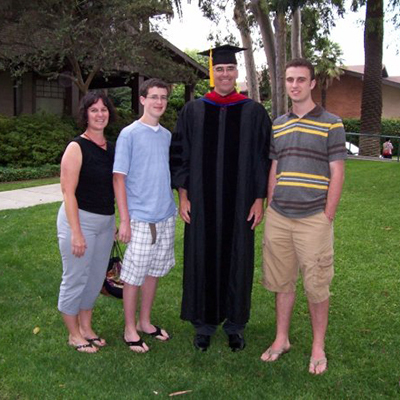 It is very likely that the single reason I ended up in seminary was due to the fact my mother had left my life so early. I am thankful for all the memories at Fuller including a second tour during my doctoral studies. But above all, this one memory will just will never be forgotten. Oh, and I am overjoyed by the news of this move as this will bring Fuller within one block of my home church in Pomona. Bringing these two important institutions in my life together is something I find very pleasing. I am praying for Fuller's new home to be a blessing for another 70 plus years."